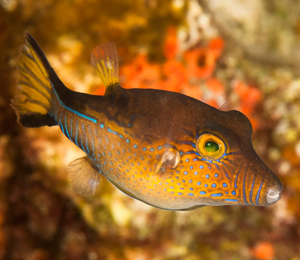 While Key West scuba diving and Key West Snorkeling, make sure to keep your eyes open for the unforgettable Sharpnose Pufferfish. With its large, inquisitive eyes and pointy, beaklike mouth, this fish is sure to become imprinted in your memory as one of the most special sightings during your Key West ocean adventure. At only four to five inches in length, the adult Sharpnose Pufferfish sports brilliant iridescent blue spots on a gray or brown body. To show submission to a neighboring fish, the territorial Pufferfish may take on a mottled color instead of its bold, bright blue spots. During the day, the Sharpnose Pufferfish may be seen foraging for food. At night, this fish usually hides in the coral reef. Like many other reef fish, the Pufferfish is omnivorous, eating such small invertebrates as worms and snails along with other food sources like plants and algae. When a Pufferfish senses a threat to its territory, it becomes aggressive and uses its muscles to assume a thicker appearance. In extreme cases, situations in which the Pufferfish expects to be eaten by another fish, for instance, the Pufferfish is able to inflate its body like a water balloon, presumably to make its consumption more difficult for the predator. Like other Pufferfish, the Sharpnose is poisonous to eat. Despite its notable territoriality, however, most Pufferfish may be comfortably approached by scuba divers who maintain a calm and unthreatening demeanor.